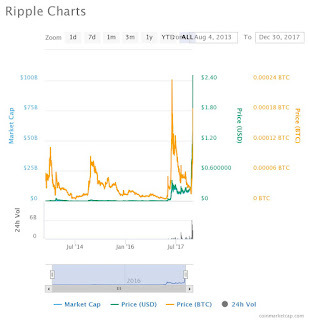 Ripple takes the crypto market by storm and emerges as the dark horse by surging above $2.5. It seems that nothing is going to stop Ripple from ending the year on a high. The cryptocurrency is on an unstoppable upswing as its value has surged by more than 77% in the past 24-hours and is currently trading at its all-time high of $2.71, according to CoinMarketCap. The past 24-hours trading volumes are at a record high of $11 billion as Ripple has confidently surpassed the $100 billion market cap thereby adding another crown to its jewel. This altcoin is currently the second most powerful cryptocurrency by market cap overtaking Ethereum, who has been occupying this position for a long time. Ripple has certainly emerged as the dark horse in the crypto market and is the only cryptocurrency on the charts, that is making new highs in spite of the market correcting heavily. There is no doubt to the fact that Bitcoin has been the most popular cryptocurrency of 2017 within the investor community. However, if you look at the percentage returns that Ripple has offered year-to-date vis-a-vis Bitcoin’s returns, it easily overshadows Bitcoin. 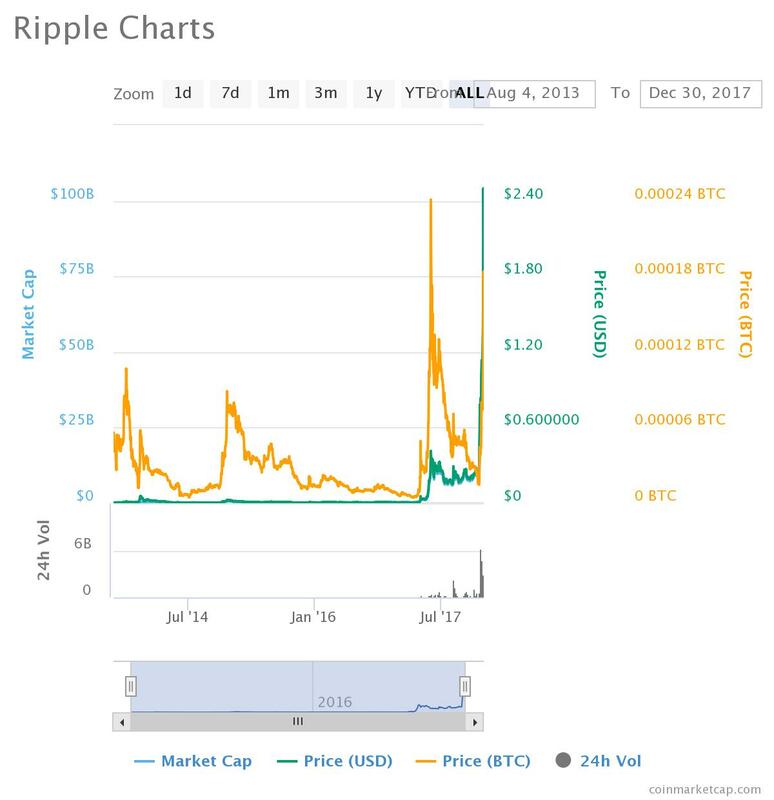 Ripple started the year of 2017 at a mere price of 0.64 cents and when compared to its current price, the percentage return is more than 42,000%. While on the other hand, Bitcoin which was on a wild rally in the past two months has slipped considerably in last 10 days and is currently trading sub $14000 levels which turns out to be less than 1400% returns yearly. However, when it comes to comparing market cap, Bitcoin is way ahead of Ripple. Bitcoin’s $247 billion market cap contributes to nearly 43% of the overall cryptocurrency market cap while at $105 billion, Ripple grabs 17.7% share of the overall pie. Today, as on date, Ripple has collaborated with more than 100 financial institutions with whom it shares its blockchain-based payments technology. Ripple offers the fastest settlement time when compared to its peers and takes just 4 seconds to enable fully settled payments. Moreover, the Ripple network is robust enough to handle scalability issues with ease. As claimed by the company, XRP can handle over 1500 transactions per-second, 24 x 7 for all weeks of the year. This is nearly 100 times more than Ether transaction per second and 250 times more than Bitcoin transactions per second. As per the company, XRP can further scale to handle Visa-level transactions. With a pathbreaking move in the past one week, it currently looks like Ripple is all set to break further records and establish itself with a strong foothold in the cryptomarkets with a great beginning to 2018.